Yogi Berra was quoted as saying “If you come to the fork in the road take it.” Actually this made perfect sense as Yogi was giving directions to his house in New Jersey. The road to his house was interrupted by a blockage and two different roads seemingly going in different directions. Each road however circled back to Yogi’s house so if you got to the fork you couldn’t go wrong. Unfortunately the forks in our life roads go in opposite directions and the destinations are completely different. In 1954 Earl Robinette was 19 years old. He was the oldest of 6 children and he had responsibilities. That day he was out about a quarter of a mile from his farm house using a horse to cultivate a cornfield. It had rained and he wasn’t able to get the tractor in the area. He saw his father frantically waiving a white towel for him to come to the house. Earl rode the horse in and his brothers gave him a clean shirt and hosed him down because he was filthy. When he entered the house to his surprise there were 3 Detroit Tigers executives there to meet him. They had discovered Earl at a tryout camp in Mount Pleasant, Michigan which is just south of his hometown of Clare County. Earl was a switch hitting outfielder with a strong arm and apparently the Tigers felt he had a great baseball future! According to Earl there was a contract laid out in front of him which included a $28,000 signing bonus. Earl was pleased to know that these executive experts had considered him worthy of such a contract and was ready to sign the deal. He looked to his parents for final approval before he took the leap but they just sat there. He never could figure out why they didn’t respond. Maybe they thought they were looking out for Earl’s best interest. Maybe they didn’t think much of the life of a baseball player. Whatever the reason they just sat there until the executives decided that it wasn’t going to happen and picked up their contract and left. 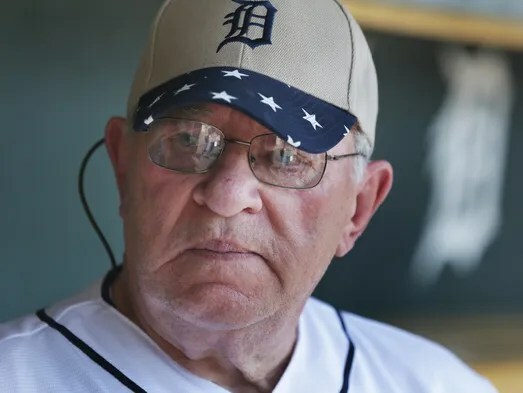 So Earl now 80 walked down the long hall way at Comerica Park. The walls were covered with Tiger players from the past. Maybe if things had worked out differently Earl’s picture would be right there with them. Of course it wasn’t and there was nothing he could do about that now. Earl was seated at a table that signings regularly took place. Most of the big names on the team had signed their contracts right on that same table. 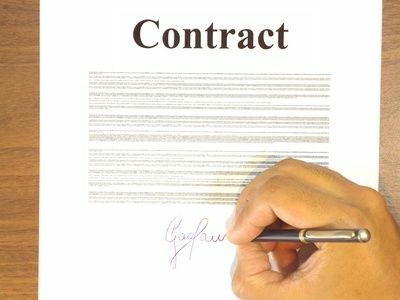 This contract was specially made for Earl and he didn’t hesitate to sign it! He was given a Tiger jersey and a hat. It was a time of reflection Had he signed, Earl summed up that he never would have met his wife and had the happy family that he ended up with. Had the signing taken place it is anyone’s guess where he would have ended up. It’s one of life’s mysteries that we all go through in one way or another based on decisions that we make. Jesus too has a contract waiting for us to sign. There isn’t a mystery as far as where the decision to follow Christ takes us. It leads to a heavenly home and eternal life with him! There won’t be a man made hall with pictures to remember. In God’s hall of fame faces shine forever and ever and never grow old! Unlike the contract from the Tigers Jesus keeps his contract on the table. You may be older now and regret the fact that you haven’t signed his contract yet. Know that it isn’t too late. Jesus is still waiting with his pen in hand. Like the directions to Yogi’s house whether you are 19 or 80 the destination after taking God’s road ends at the same place! Where was all the fine print? or send him on his way? A friend and I were walking out of our work building last week. As we pushed open the door we could feel the sun warming our faces yet a nice breeze blowing just enough to cool things off. It was a picture perfect day and made us feel good as we stepped outside! “I wish every day was like this”, I stated. “If it was we wouldn’t appreciate it”, was the reply. It is true that if every day was perfect we would come to expect it. We wouldn’t appreciate the good that we were given. We need to be thankful not only for the sunshine but also the rain. I’ve heard it throughout my life that you have to take the bad with the good. The famous lyrics of a country song written by Joe South in 1967 and made popular by Lynn Anderson in 1970 still come to mind. “I Beg your pardon, I never promised you a rose garden. Along with the sunshine, there has to be a little rain sometimes.” These lyrics are so true not only in the weather but in life. Have you ever had something go totally wrong? Have you ever been through trials and tribulation? Those questions are a lot like asking if you have ever been in the rain? Did you know that there are at least 15 benefits we receive from rain? I’ve heard the phrase people use sometimes when things aren’t going well. They will say “I’m going through the fire.” Did you know that going through the fire is a good thing? Extreme heating and cooling metals hardens or soften them for their ultimate purpose. Softening them to be more pliable or hardening them to put the strength of the product in place and prevent it from going back to it’s softened form. Also using intense heat flushes the impurities of the metal out. In the same way God uses circumstances that happen in our lives to mold us for his divine purpose. As everyone knows who have lived a little while things don’t always go as planned. This is especially true in life. Sometimes things come up that interrupt our lives much like the rain interrupts our plans. When the rain is coming down in our lives it is easy to complain. “Why is this happening to me?”, we might say. Sometimes it can come out in our conversations as we complain and let the world know we are not happy. Of course we have a hard time feeling happy when the storm clouds hit and the rain pours in our lives. Yet if we can muster the faith to believe that God is in our situation and working things out for our good the storm becomes less difficult to endure. It is natural to not enjoy the trying times we go through. We enjoy life when it is going well and endure life when it isn’t. I had a friend named Herb that used to come into our office from time to time. Herb and I would laugh about things and he was always upbeat. I had known of Herb starting in the 1980’s as at that time he was the Director of Financial Aid. Though I knew of him I didn’t know him until a few years ago. Herb was 90 years old when I last saw him. He was always uplifting and it was a real joy to talk to him. One of the last times I talked to Herb I asked him how he had been? Reluctantly he told me that this last week had been tough because his wife had passed away. Knowing that Herb had been married for numerous years and loved his wife dearly I was astonished by how composed he was. I know it had to be hard but he was determined to not have this horrible loss he was feeling affect me. When Herb passed away just a few short weeks ago the memory he gave me that day still shines. He was that same uplifting person no matter what was going on in his own life. There was bright sun rays shining through his heavy dark clouds. There are the other kind of people too. You know the ones that are the complete opposites of Herb. When even the slightest bit of turbulence shakes their life you hear about it. It is hard being around these people because they zap the energy right out of you. A little cloud in their world leads to a dark gloomy outlook on life. Instead of having faith and trusting that God will see them through they choose to be miserable. It is almost like they enjoy their dilemma and are the victims of life. Not only do they seem to enjoy their situation but they enjoy bringing others down with it. They are the victim and they want you to walk away thinking that the world is against them. When I think about the rain that we all need sometimes I have to make an examination of my own life. Do I always uplift people no matter what is happening in my world? Am I a good rainy day person or do I need a sunny day to shine on others? Sometimes I fail miserably with the answers God is patient with me as he shines the light on my faults and shows me how I should be. He tells me that rain is only something I need to go through to make me stronger! I miss Herb coming by. I miss his uplifting attitude as even in his advanced years he was amazing! He always left me with a smile on my face. I would like to lift others too no matter what is happening in my own life. I realize that the rain is good for me and if I let him God will mold me through the fire much like the craftsman does with his metal piece. When we depart and I am only a memory to you, I would much rather that you remember me as someone you enjoyed rather than that complaining ungrateful person you had to endure.